It takes incredible confidence from both the player, and his manager, to install a young centre-back in the starting eleven; it’s even more brave to do so when the centre-back in question has no prior experience of European football. But following his success in South America, helping underdogs Atletico Nacional to the Copa Libertadores title, Sanchez has taken well to life in Europe as Ajax pushed Feyenoord till the last day for the title and nearly pulled off a European success against Manchester United. The 20-year-old started the season in the reserve team, missing the opening game of the Eredivisie season as a result. Since then he’s started every single league game (except the penultimate home game as Peter Bosz saved Sanchez for mid-week Europa League action), as Ajax missed out on the title by a single point. He played a crucial part in European competition as well on road to the Europa League final, playing the full minutes of every game (including 120 against Schalke in second leg of the quarter-finals), except the last two group games with qualification confirmed and the second leg of the round of 16 due to suspension. For the first time in the history of these awards, the winner is a) a pure centre-back and b) not European. With Sanchez still only 20-years-old, he’ll remain eligible for these awards for two more seasons. With no one having retained their title across all the categories over the history of these awards, Sanchez may well be the first to do so. A mobile and athletic centre half, Sanchez is adept at utilising his 83kg frame when required to out-muscle opposing forwards. With an ability to read the play like few his age, he also possesses a deceptive pace that allows him to remain a step ahead of the opposition – an attribute he showcased when beating Leon de Kogel to head the ball to safety after the Go Ahead Eagles forward had seen his spot-kick saved by Andre Onana during the two sides’ meeting at De Adelaarshorst on 28th August. The young Colombian showed the strength of character to make amends after having been adjudged to have clipped the heels of Marcel Ritzmaier in the area by referee, Pol van Boekel just seconds earlier. Indeed, despite being an underrated part of his game, Sanchez’s ability to make up ground when placed at a disadvantage to an opposing player is quite remarkable and was clear for all to see when, he was seemingly left for dead on the half way line by Utrecht’s Richairo Zivkovic as the 20-year-old speedster was set clear by an incisive through ball from Sebastien Haller. The 20-year-old Colombian ate up the ground between he and his quarry – managing to not only catch but pass Zivkovic in order to deny the young forward – who was hoping to impress against his parent club, the opportunity to test the reflexes of the previously exposed Andre Onana in the Ajax net, to ultimately deny Zivkovic with a well-timed sliding challenge just inside the area. Read a full Scout Report on Sanchez here. “One of a host of Colombians who made their names during Atletico Nacional’s Copa Libertadores success in 2016 before the side was inevitably ripped apart, the 20-year-old has enjoyed a fine first season in Europe with a young Ajax side that proved to be the perfect fit. 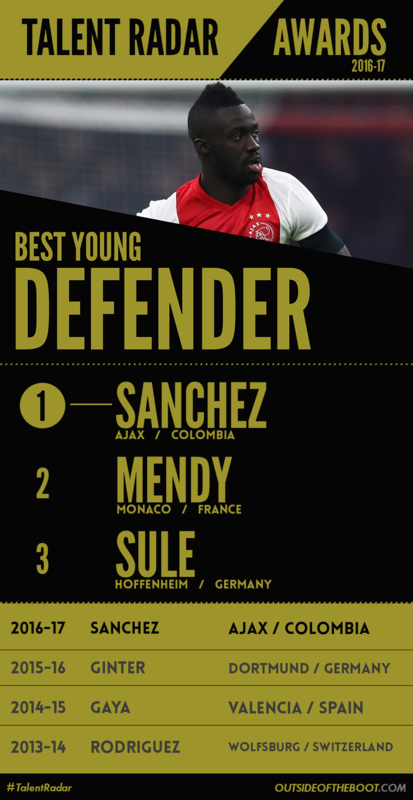 Named the club’s Player of the Year in his first season abroad, Sanchez is already attracting attention from Europe’s big boys. Big, strong, athletic and increasingly comfortable on the ball, he has all the tools to be a superstar, though he is still a little raw. A mightily impressive though ill-advised late surge upfield in the final moments of a needlessly nervy Europa League night in Lyon earlier this month provided succinct illustration of a young talent still very much at the developmental stage.